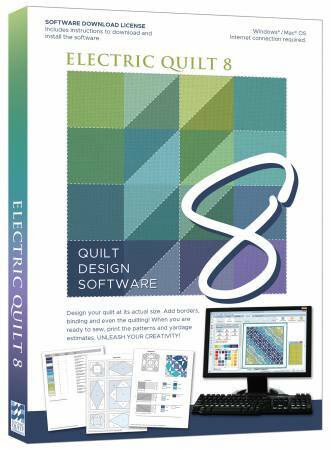 Electric Quilt EQ8 Quilt Design Software. The new version is redesigned with a new look that includes larger graphics for faster learning and includes 40 new and updated features and thousands of new block designs and fabrics. The license package includes the EQ8 license/password, instructions to download from the EQ8 website and a booklet with instructions for installation, activations and use of EQ8. NOTE: the package does NOT include any media device--just the license ID and Password to download the software online. INTERNET access REQUIRED for activations, registration and validation along with other features. Package includes license for PC or MAC.